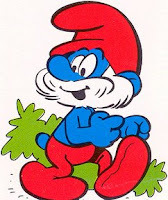 The Muze: How Tall is a Smurf, Anyway? How Tall is a Smurf, Anyway? Three apples tall, apparently. I stand corrected. I thought smurfs were more like a foot or two tall. And Gargamel's cat is named Azrael. Our dinner conversation last night was filled with fascinating 80s tidbits and a heated debate about Lost vs. Heroes (Season 1). Geography buffs should take the quiz on www.geographyzone.com. Now I can find Lesotho and Luxembourg, but overall I brought down the average geography IQ of Americans. One more thing: For a neat do-gooder gift, visit Kiva.org. We are headed to Boston. Happy holls to all.